Sweet and sour mix goes by a few names, including sour mix and bar mix, sometimes it's even simply called a lemon sour or a lime sour. It is a popular drink ingredient that should be present in every bar. You will need it for a number of cocktail recipes, including many margaritas and other tropical or sour drinks. It can also be a convenient substitute for other ingredients in even more drinks. The great news is that sour mix is incredibly easy to make from scratch. This saves money and helps you create better, fresher tasting drinks. Essentially, sour mix is a simple syrup that is flavored with a sour citrus fruit. It's often a combination of lemon and lime juices, though it can be made with either. It's a great shortcut for adding both a sweet and sour element to your drinks using a single ingredient. Sour mix also tends to be a little thinner than standard simple syrup. Though you can adjust the recipe, it's typically made with a 3:1 ratio of liquid (water and juice) to sugar. This naturally creates a runnier syrup. While you can purchase sour mix at almost any liquor store, the options available usually leave a lot to be desired. Most are either too sweet or too sour and it's very common to find them with artificial flavors and sweeteners. As with almost every drink mixer, fresh is best and you will find that a housemade sour mix produces better tasting cocktails. Making your own sour mix is also cost-efficient. You can make as little or as much as you need and the raw ingredients are inexpensive. Generally, a batch of fresh sour costs less than $2 to make and takes no more than 20 minutes of your time. Really, there is no reason to avoid learning this simple recipe! There are a few ways to make a fresh sour mix and they all begin with simple syrup, which is nothing more than sugar and water. These recipes are easy and can be adapted to suit your personal taste or the drinks you're making at the moment. You can also double or triple the recipes to create a larger batch as needed. Method 1: Make the simple syrup by combining 1 cup sugar with 1 cup water in a saucepan over medium heat, stirring until the sugar is completely dissolved. Reduce heat and simmer for about 5 minutes. Remove the pan from the heat and stir in 1 cup each fresh lime juice and fresh lemon juice. Allow it to cool before bottling and storing in the refrigerator. Method 2: Combine 1 cup sugar and 1 cup water in a cocktail shaker or a bottle with a tight seal. Shake until the sugar is dissolved (this will take some time and effort), creating a simple syrup. Add 1 cup each lemon and lime juices, bottle, and refrigerate. Method 3: Combine one part pre-made simple syrup with one part lemon or lime juice (or equal parts of the two fruits). This last method is great for a last-minute sour mix if you already have the syrup in stock. It's also handy if you're making a large batch of simple syrup and want to divide it to create sour mix at the same time. No matter which method you choose, you can adjust the lemon and lime juice ratio to fit your specific taste. You can also make it with either lemon or lime juice exclusively by using 2 cups (or parts) of either juice. For instance, you might want to use a lime sour mix in a frozen lime margarita to enhance that fruit's flavor. In a similar fashion, the honey bun recipe specifically calls for "fresh lemon sour." Many classic cocktails call for egg whites because it gives the finished drink a luscious, foamy texture when shaken. If you're making a few rounds of a specific style of drink, such as the whiskey sour, you can add the egg white directly into your sour mix. In this case, you'd simply have to shake your favorite whiskey with your custom sour, making the drink even quicker to mix up than it already is. If you'd like to add egg whites to your sour mix, make sure that your eggs are as fresh as can be first. There is an easy water test you can use to ensure you're not going to be drinking eggs that are too old. To make this sour mix, simply add one egg white for every 2 cups of sour mix. Do this after the sour mix has cooled completely and make sure to refrigerate it whenever you're not mixing drinks. The egg will significantly reduce the syrup's shelf life and it would be best two use it within a day or two. Once you have a sour mix, there are many fun ways to incorporate it into your drinks, both spiked and nonalcoholic. After a tasting the difference of a fresh sour, you'll find endless possibilities to put it to good use. Use it in any cocktail recipe that calls for sour mix. There are countless recipes available and you could start with old favorites like the Long Island iced tea and apricot sour. Also, a fresh lemon sour is essential for the famous cable car cocktail and a standard sour is found in many margarita recipes, including the super fun gummy bear margarita. 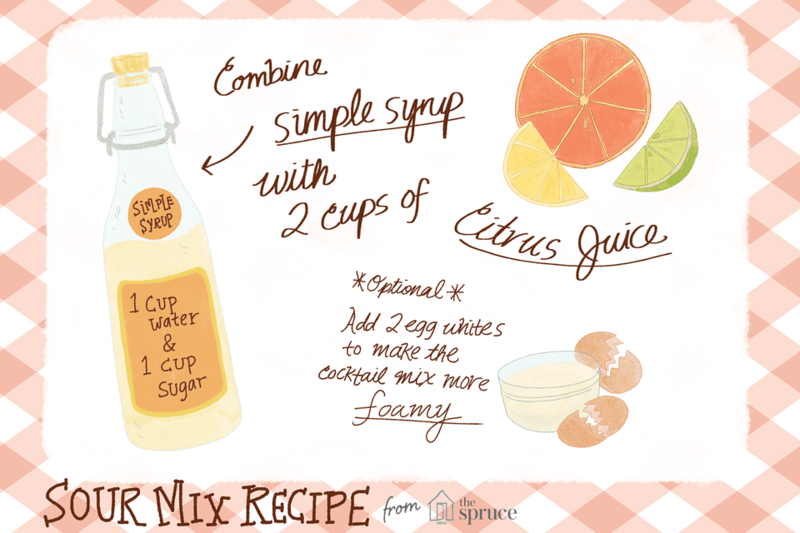 Sour mix can be used to adjust any drink's flavor when you want to add both sweet and sour elements to give it a spark. For example, a splash of sour makes a livelier gin and tonic and sweetens it just ever so slightly. Sour mix can also be used as a shortcut in cocktails that call for simple syrup and either lemon or lime juices separately. You will find this useful for many of the classic cocktails that were developed before sour mix was widely used in the bar. For instance, you can replace the syrup and lemon juice of the popular Tom Collins with a single shot of sour mix. The New Orleans Fizz is another great example because the recipe uses both lemon and lime juices along with syrup. If you do this substitution, you may have to use more or less sour mix than the recipe calls for to obtain a balanced cocktail. As long as you have sour mix in the fridge, you can pour club soda over an ounce or so of sour to create the freshest lemon-lime soda that rivals 7-Up or Sprite. Similarly, sour mix is essentially a concentrate for homemade lemonade and all you have to do is add water. While lemon and lime are the standard citrus fruits used in a sour, any citrus juice will work. Consider making a grapefruit sour or an orange sour to add a twist to your drinks. You can also have fun with less common citrus fruits, like blood oranges, key limes, pomelos, and tangerines. Homemade sour mix should be bottled in a well-sealed container and stored in the refrigerator. It will have a shelf life of 2 to 3 weeks. The best sour mix uses fresh citrus juice. This adds to the natural taste and many bottled lime and lemon juices are already sweetened. If you use one that is, you might want to reduce the sugar slightly.